Open more than one document at a time. Open a copy of a document instead of the original. This keeps you from overwriting the original file accidentally — very helpful if you're making several variations of one document. Open a template under its own name. This makes editing templates easier than it is with other programs, specifically QuarkXPress. Open documents created with some versions of PageMaker and QuarkXPress: QuarkXPress and QuarkXPress Passport versions 3.3 through 4.1 and PageMaker versions 6.0 through 7.0. InDesign's File menu displays the names of the ten most recently saved documents in the Open Recent submenu that appears under the Open option in the File menu after you have opened a file. You can change how many recently saved files are shown by using the Number of Recent Items to Display option in the File Handling pane of the Preferences dialog box (choose InDesign => Preferences => File Handling or choose Edit => Preferences => File Handling or press Ctrl+K in Windows). Choose File => Open or Ctrl+O. The Open a File dialog box shown in Figure 1 appears. Locate and open the folder that contains the documents you want to open. Click a file name or Ctrl and click multiple file names. Note that InDesign CS5 can open files created by any previous version of InDesign, in addition to CS5-created files. The InDesign Markup (IDML) format is a variation of the standard InDesign CS5 format that lets InDesign CS4 read your CS5 files, minus any CS5-specific formatting. (It can also be used with some other specialized programs.) Also note that there is no save or export option that lets InDesign CS3 or earlier open files created in InDesign CS5. The name of the pop-up menu for selecting file types differs between the Mac and Windows versions of InDesign, as does the menu option for displaying all files (including those with no file name extensions). Click Open Normal (Mac) or Normal (Windows) at the bottom of the Open a Filedialog box if you want to open the original document (rather than a copy of the document); click Open Copy (Mac) or Copy (Windows) to open a copy of a document(see Figure 1). When you open a copy of a document, it's assigned a default name(Untitled-1, Untitled-2, and so on). Figure 1. 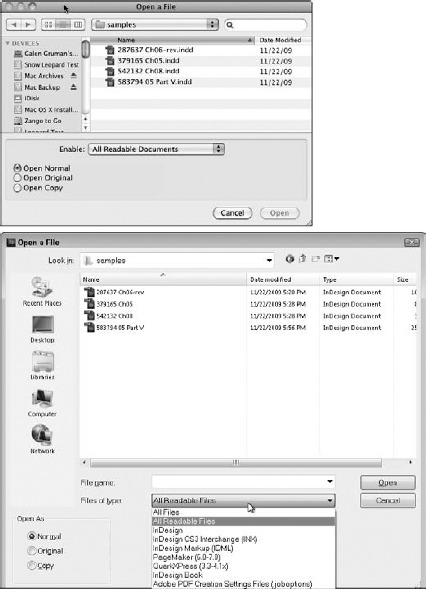 The Open a File dialog box, with the Mac version at top and the Windows version at bottom. When you open a file, you have the option to open it normally (Open Normal on the Mac, or Normal in Windows), open the original copy of a template (Open Original or Original), or open a copy of the file (Open Copy or Copy). Both Windows and Mac OS X use icons to show you (and tell programs) the format of a file. They also use file name extensions to identify the file type, but by default these file name extensions are hidden from view when you open folders. InDesign uses the file name extension .indd to denote InDesign documents. Without this file name extension, you won't be able to double-click a file icon to open it, although you can still open the file from InDesign's Open a File dialog box (choose File => Open or Ctrl+O), as long as you select All Documents from the Enable pop-up menu (on the Mac) or All Files from the Files of Type pop-up menu (in Windows). Note that the Place dialog box for importing text and graphics — does not have the Enable pop-up menu on the Mac; InDesign shows all files, even unsupported ones, in this dialog box. If file name extensions are hidden in Windows XP, open any folder, choose Tools => Folder Options, and then select the View tab. (You have to have a disk or folder open to have the View menu.) Select the Show Hidden Files and Folders option and then click OK. In Windows Vista, choose Start => Computer, choose Organize => Folder, and then choose Search Options in the dialog box that appears. Go to the View pane and select the Show Hidden Files and Folders option, then click OK. In Windows 7, the steps are the same as for Vista, except you choose Folder and Search Options (Windows 7's name for Vista's Search Options). Click OK to close the dialog box. Each document you open appears in a separate document window. The page and view magnification shown when a document was last saved is used when you open the document. You can also open an InDesign document or template by double-clicking its file icon. If InDesign is not running, double-clicking a document or template file — as long as it has the proper file name extension (.indd for documents and .indt for templates) — launches the application and opens the document/template. If InDesign is already running, the document appears in a new window. Whenever you save a document, you have the option of saving a standard document file or a template . A template is an InDesign file used to create multiple iterations of the same publication. For example, if you produce a monthly newsletter, you can save gobs of time and ensure consistency from issue to issue by using a template asR the starting point for each edition of the newsletter. A template is essentially the shell of a publication that contains the basic framework — page layout, master pages, styles, and so on — but doesn't contain any actual content. When you open a template, you have two choices: You can open a copy of the file and use it to create a new publication or you can open the original file, make changes, and then save an updated version of the template. If you want to use a template as the starting point for a new publication, choose File => Open or Ctrl+O, locate and select the template, and make sure Open Normal (Mac) or Normal (Windows) is selected in the Open a File dialog box (refer to Figure 1) before you click Open. If you want to modify a template, click Open Original (Mac) or Open (Windows) at the bottom of the dialog box. If Open Normal (Mac) or Normal (Windows) is selected, clicking Open opens a new document window and assigns the document a default name: Untitled-1, Untitled-2, and so on. If Open Original (Mac) or Original (Windows) is selected, the original file opens and the original name appears in the title bar. There's another way to open documents and templates in InDesign: Choose File => Browse in Bridge or Ctrl+Alt+O to open documents or templates, or choose File => New => Document from Template to open just templates. Choosing either option opens the Adobe Bridge program, shown in Figure 2, where you can browse for a file to open. Figure 2. You can access files through the Adobe Bridge program, a common file environment for Creative Suite applications. Bridge is designed to be a central repository for Creative Suite programs and support files, mainly for use in workgroup situations but also as an Adobe-centric alterative to the standard Mac and Windows file systems. Bridge's biggest attraction is that it lets you see previews of and file information for almost all the files types you'd be working with in your layouts (and Bridge does come with several canned templates created by Adobe that you might want to consider using). There's no difference in the documents or templates available via Bridge than those available via the regular Open a File dialog box. It's just a different organizational structure for your files. If you want to access the template files stored in Bridge's InDesign folder without using Bridge itself, navigate to Library:Application Support:Adobe:Templates:InDesign on the Mac, or to Program Files/Common Files/Adobe/Templates/InDesign in Windows. Of course, if you do prefer to use Bridge to store template files, you use InDesign's regular Save As dialog box, select InDesign CS5 Template as the file format, and navigate to the Bridge application's InDesign folder. You can access Bridge files directly from the Bridge application, using its folder-based interface to find files of interest. Most of Bridge's features are oriented to Photoshop users, so chances are you can just ignore Bridge. The new Mini Bridge panel (choose Window => Mini Bridge) is a faster way to find files using Bridge's file environment. Click the Search iconic button to search for specific files, or click the Browse Files iconic button to navigate for files using a pared-down version of the Adobe Bridge file-navigation controls.